Long shelf life when stored per manufacturer’s directions. 2012 or newer Pack Date. Genuine US War Fighter Rations are the ultimate survivalist, Prepper & outdoor enthusiast Meal. Ideal for hunting, camping, hiking, fishing, boating, and emergency food supply. Designed for maximum endurance and nutrition with average 1250 calories per meal. 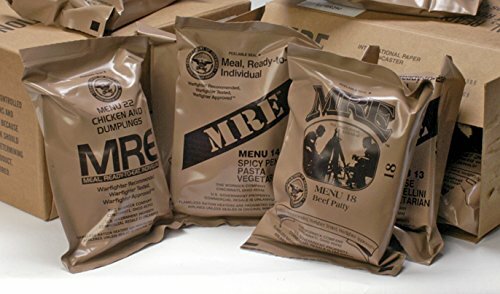 All MREs are 2012 and newer. Long shelf life when stored per manufacturer's directions. 2012 or newer Pack Date.